FOSEL's Sixth Annual Easter Egg Hunt Drew a Large Crowd with Many Volunteers, a City Council Candidate and Kids Young and Old on the First Mild Day after a Long Cold Snap.. 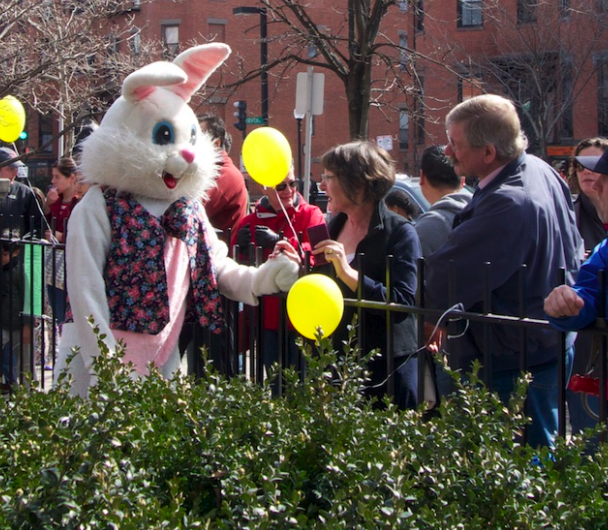 Warm sunshine, a tall bunny, and a hundred or so eager egg hunters made the Sixth Annual Easter Egg Hunt, Sunday, March 31, in Library Park another big success. Many thanks to all the volunteers who made it happen: the steadfast bunny, otherwise known as Jean-Jacques Dubreuil, who had to be sweltering inside that furry suit during the many photo ops requested by the crowd; the FOSEL folks who laboriously stuffed more than 1200 plastic eggs with chocolates and poems; Nathalie Dubreuil, who collated a new crop of poems; other library supporters like at-large city council candidate Suzanne Lee who hid countless eggs; and the many Friends who showed up at 9:30 AM to set up snack tables and blow up balloons. Thanks most of all to the South End neighbors for turning out and creating such a festive, friendly event. People seemed to linger and chat long after eggs were snatched up and the delicious snacks --including the annual contribution of Liane Crawford's amazing cupcakes-- were eaten. The donation jar was generously filled and parents thanked the volunteers over and over. One dad said, “This is the most well-executed egg hunt we’ve been to.” Several parents expressed gratitude for the roped-off area for small children. 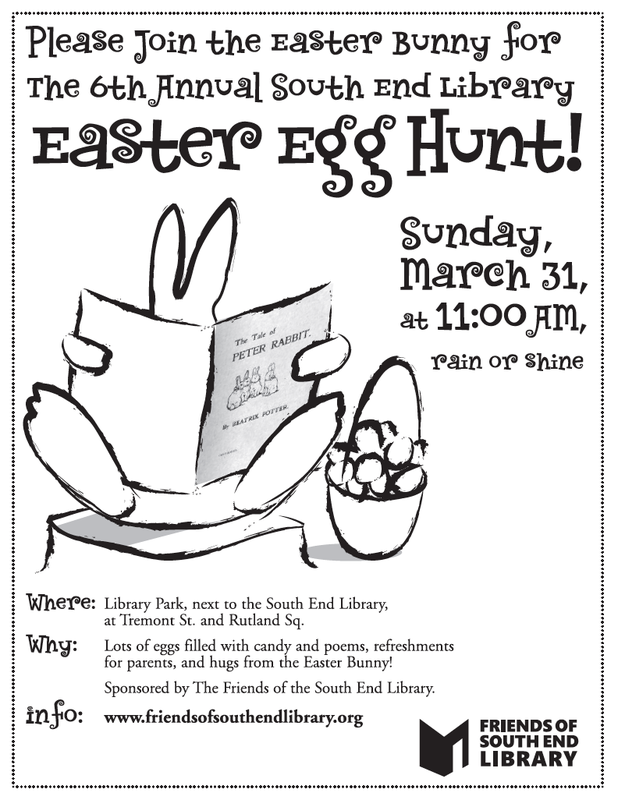 The egg hunt is one of the most fun neighborhood things FOSEL does, and it seems to be more appreciated every year. Many thanks, too, to Area D4 for their assistance and to the wonderful staff of the South End Library for, among other things, their beautiful painting of the Easter bunny. Last but not least, big a big thank-you to Mary Owens for designing yet another poster for her beloved library. Mike Lloyd took many pictures, some featured on this page. Others are now on display in the library’s window.